Nothing says fall like mums. The chrysanthemum is a mainstay of the late summer and fall garden. The bright, showy flowers are traditionally used in floral displays and arrangements. Chrysanthemums, or mums, are available with many variations in growth habit, color, and flower form. Bloom types range from large, billowing spider mums to small, tidy button mums. Mums flower in shades of white, yellow, red, and purple. They bloom from mid-summer to late fall, depending on the variety. The very late-blooming mums are commonly treated as annuals for temporary, late-season color. Mums can be tall and upright-growing or compact plants under 18 inches. Mums are commonly used for temporary color in pots, but are also excellent perennials to grow in your garden. Mums prefer moist, well-drained garden soil in a sunny spot. Add organic matter such as compost at planting time. The best time to plant mums is in the spring, though you can also plant them in the summer or early fall. The earlier you plant, the longer your mums will have to develop good root systems before winter. To encourage bushy mums with lots of flowers, pinch back the growing tips throughout the summer. Starting in May, pinch shoots back each time they reach 6 inches long. Stop pinching on July 4th in the North, or mid-July in the South, to give the plants enough time to bloom. After flowering, you may trim off the dead blossoms. Flower - White, yellow, red, purple. Size anfd style vary widely. Mums may be planted in zones 3-9. Be sure to choose mums with bloom times that match your climate. Shortening days trigger mums to bloom in the fall, and some varieties react more quickly than others. Thus, a particular mum variety may be early-, midseason-, or late-blooming. Early and midseason varieties are ideal for areas in the middle of the country. Midseason and late mums are best in the South. Where freezes come early, you should plant early-blooming mums. Mums purchased from florists generally don't make good garden plants. They take too long to come in to bloom in the fall. You can successfully grow mums as perennials even if you live in the cold climates of zones 3 and 4. But choose varieties carefully and plant them early. Mums are frequently planted in the fall for late-season color. Unfortunately, fall-planted mums often aren't well enough established to successfully overwinter in cold climates. To overwinter mums successfully, plant small, unblooming plants of hardy cultivars earlier in the season. Once the soil has frozen in the winter, mulch mums with straw or leaves to protect them over the winter. Mums multiply freely. Every 1 to 3 years, you may dig up and divide them. Spring is the best time to do this. Mums are also easy to root from cuttings taken in the spring. Plant mums among early and late summer-blooming perennials to prolong your garden's flowering season. For a spectacular show in late summer and fall, plant mums with other late-blooming perennials such as asters, sedum, and ornamental grasses. Plant your mums near large-flowered daffodils or tulips to provide spring color while a chrysanthemum is just starting to grow. 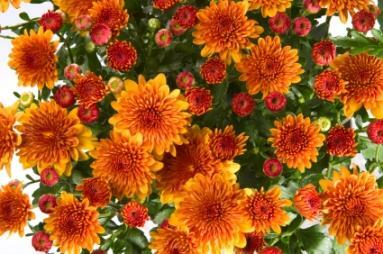 There are hundreds of excellent varieties of chrysanthemums available. Seek the advice of local growers or garden centers to find out which are best for your area. Here is a short list of some noteworthy varieties. Clara Curtis is a favorite chrysanthemum. It is compact-just 18-24 inches tall-and flowers very early. Its warm pink, daisy flowers with raised yellow centers are fragrant. Emperor of China is taller, growing to 40 inches, and blooms later. It is a cushion-type mum with pink-white flowers. The foliage is marked with red. 'Golden Jubilee' has large, deep gold flowers on 18" plants. It blooms early and is very hardy. Gypsy Wine is only 12 to 15 inches tall. It is a fragrant mum with wine red pompom flowers that bloom early. Maroon Pride was introduced by the University of Minnesota in 1991. It has rich, dark red flowers in late August. It is very hardy. 'Rose Blush' has large, mauve flowers. It blooms midseason, grows to 16 inches, and is very hardy. Sarah has large, quilled, golden butterscotch flowers on sturdy plants. Blooms late. Sunny Morning has large clear yellow flowers on bushy, 14-inch plants. Blooms midseason. Chrysanthemum Arcticum - A good plant for the rock garden, about a foot high, flowering all the summer; white, tinged with lilac or rose. Tricolor Chrysanthemum (Chrysanthemum Carinatum) - A showy annual from N. Africa, which varies much in cultivation, and is valuable if only for its yield of flowers for cutting. There are double white and yellow forms, and the showy ones known as C. Burridgeanum. Dunnetts varieties of the same plant are also good. They are propagated from seeds sown in April in open beds or borders where the plants are to flower. Crown Daisy (Chrysanthemum Coronarium) - A handsome annual 2 to 3 feet high in its wild form in S. Europe and N. Africa, and in cultivation breaking into a number of forms, few of them so pretty as the single wild flower, pale yellow or buff, treated as a half-hardy annual, and sown in good ground in April. Paris Daisy, Marguerite (Chrysanthemum Frutescens) - A half-hardy bushy plant from the Canary Isles; the foliage glaucous; the flowers large, pure white, with a yellow centre, and appearing from June until cut down by frost. Several forms or allies are also, valuable, such as the yellow Etoile dOr and Comtesse de Chambord. These are of easy culture and propagation, for the outdoor garden, treated as half-hardy plants and put out in May. Chrysanthemum Indicum - The parent of the numerous varieties of the hybrid Chrysanthemum. Although in England, generally, open-air culture will often be impracticable, the outdoor kinds are so pretty that it is worthwhile trying to secure the best kinds where the climate allows of their growth out of doors.